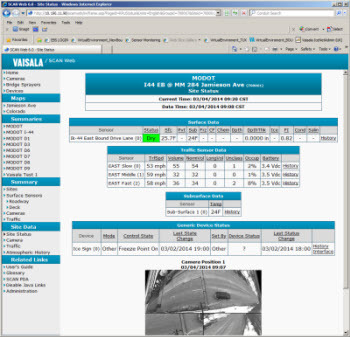 is the latest Road/Runway Weather Information Systems (RWIS) user interface from Vaisala Inc. uses standard Internet technologies to display data from your RWIS. These technologies include the Transmission Control Protocol/Internet Protocol (TCP/IP), the Hypertext Transfer Protocol (HTTP), the Hypertext Markup Language (HTML), and Active Server Pages (ASPs). These standards form the foundation of what has become commonly known as the World Wide Web (WWW). makes use of these standard technologies to display SCAN RWIS data using widely available HTML browsers such as Netscape Navigator and Microsoft Internet Explorer. provides powerful graphical data display pages. Users can easily select various data views to display produce either concise summary views or detailed RWIS data. Site Summary, Site Status, and historical data pages are available to enhance operational effectiveness. In addition, integrates current video images when sites are configured with video cameras. The purpose of this document is to describe standard functionality. Customized pages and/or features will not be covered by this document. ties Web addresses, or Uniform Resource Locators (URLs), to the RWIS data collected in your SQL database. Your site is a collection of RWIS data views that are displayed on web pages in your web browser. 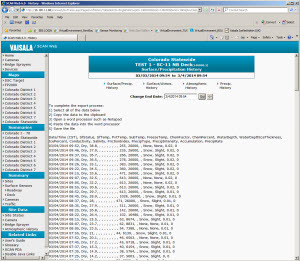 uses Active Server Pages (ASPs) to dynamically build each web page displaying the latest data collected by your RWIS. Each page also contains hyperlinks that allow you to move easily between pages to view your all of your RWIS data in various formats. Accessing the data from your Server can be accomplished two ways. The fastest way is via a network connection. Deploying your SCAN Server on a local area network is by all means the preferred way to distribute your RWIS data to the people who need it the most. To access your site from a network, simply open your Internet browser and enter the name of the Server in the Address box of your browser. Your initial page should be displayed when you enter this name and press return. If you get an error message, you may need to insert an entry for the web server in the Hosts file or you can try entering the Internet Protocol (IP) address of the web server. Please contact your System or Network Administrator if you experience problems accessing the web site across your network. You can also provide dial-in user access using a phone line and a remote access service (RAS) dial-up connection. Users would require a dial-up connection and a modem on their personal computer. Dial-in lines and modems dedicated for user access would also be required on your SCAN Server. Once users connect to the SCAN Server they can use their browser of choice to access the user interface as if they were on a network. Contact your Information Services or System Administrator for more information on accessing your Server. To set as your default home page, set the Home page as the default "Home" page in your browser's preferences. If you don't want the page to be your home page and you don't want to type in the name every time, you can add the page to your Favorites folder. The method for setting preferences differs slightly between Netscape and Internet Explorer so please refer to your browser's on-line documentation for details. Once the page is added to your Favorites list, you can access the page at any time by selecting the Favorites pull down menu and selecting the page. Our corporate office hours are between 8:00am - 5:00pm U.S. Central Time, Monday - Friday (excluding holidays). If you require technical support concerning this product send an e-mail to Help Desk. Be sure to visit our corporate web site at www.vaisala.com. The navigation bar is displayed on the left side of the screen and provides a standard location for the majority of links. The navigation bar has been split into five main sections: , Maps, Summaries, Summary, and Site. Different sections will be displayed based on the page you are currently viewing. Most pages also contain embedded links that provide additional navigation capabilities. The remainder of this document will describe the each menu section and provide a detailed description for each page. The menu section will be displayed on all pages. 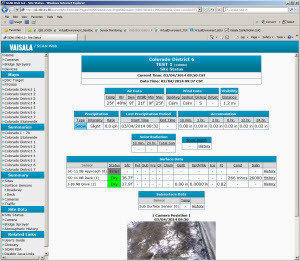 It contains links to system level pages such as the Home page the Camera Summary, the Bridge Sprayer Summary, and the Slide Show page (when configured). You may also request other links to be added to this section such as a link to a state DOT home page. The home page is also referred to as the main menu page. The default Home page will display your registration information and copyright and software license information. The Home link provides an easy way to return to your Home page. This page can be modified to display custom information for your installation if requested. The Home page should be used as a starting point for each session and provides access to all RWIS data. 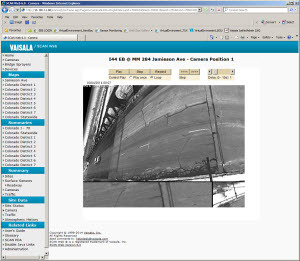 The Cameras link provides a central location for all of your site video images that are collected by your system. This link will only be displayed when cameras are installed. The default thumbnail image for each site will be displayed. Simply select the image to display the desired camera image. Please refer to the Camera page description provided in the Site Data menu section for more details. The Bridge Sprayers link provides a central location for all of your bridge sprayers that are configured on your system. This link will only be displayed when bridge sprayers are installed as part of your SCAN system. Please refer to the Bridge Sprayers section for more details. The Devices link provides a central location for all of your devices that are configured on your system. This link will only be displayed when devices are installed as part of your SCAN system. Please refer to the Site Status section for more details. When configured, the Slide Show page displays a sequence of predefined pages. The same set of web pages will be displayed for all users. The Related Links menu section will be displayed on all pages. The User's Guide is provided for information on the use of and provides a quick link to this document. also provides an on-line glossary which helps identify each data item as well as important RWIS terms. Simply select a term or column heading to display a brief description. Additional links can be added to the menu section for any URL address by contacting your Vaisala representative. The Summaries menu section contains links to each Site Group Summary page that is configured on your system. A site group can best be described as a logical group or subset of RWIS sites such as a state, district, city, or airport. By selecting a link from this section you will display a Site Summary page for the group selected. Once you have selected a group, the Summary Menu will be displayed on the navigation bar. This section provides links to the different types of summary pages provided by including Sites, Sensors, and Traffic. All summary pages will automatically refresh every six minutes and contain links to an on-line glossary that provides definitions for each column. Users can link to the glossary by selecting the column heading links to see a definition for each data item. The glossary will also provide details concerning whether a particular data item is supported for NTCIP sites. Other links may be displayed in the right most column of the Summary page, such as maps, history, and cameras. Links will only be displayed if a site supports the sensor type or function. Links specific to each surface sensor (i.e. History Cast) is listed in the right most column on each surface sensor row. Links that only pertain to a general site are listed in the right most column on each site's atmospheric row (i.e. Camera, Traffic, and Site Maps). The Cameras link located in the Summary menu section provides a central location for all of your site video images that are collected by the sites contained in your current summary group. The default thumbnail image for each site will be displayed. Simply select the image to display the desired camera image. Please refer to the Camera page description provided in the Site Data menu section for more details. Links to each site's Traffic Status page and camera page (if configured) are provided, as well as a link to the Traffic History and Daily Count pages. For In Lane sensors, links will also be provided to Traffic Speed and Classification data. Refer to the Traffic Section for more details. Once a specific site has been selected the Site Menu will be displayed. This section provides links to all site specific pages such as the Site Status, Camera, Bridge Sprayer Status, Traffic Status, and Atmospheric History pages. Only links that pertain to the selected site will be displayed. 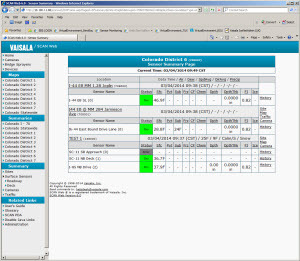 All pages that display current RWIS data will automatically refresh every six minutes. A link to the Device Interface page will also be provided and requires user authenication. Refer to the Administration User's Guide for more details. Embedded throughout this page are links to each sensor's history data. Links to pages requiring user authentication will be provided to activate and configure bridge sprayers when sprayers are installed at NTCIP compliant sites. The Camera page provides a full size view of the camera image collected from the selected site. This page also provides a link (located at the upper right of the camera page) to a Java applet that allows you to loop through the last six images collected at the site. The looping applet provides the user with a standard "recorder" control bar including a play, rewind, forward, scroll, stop, and time delay between frames. The date and time of each camera image will be displayed as the images are displayed. A Camera Configuration link will also be provided if the site has been configured to support a camera with multiple camera positions. Camera links will only be displayed for sites configured with cameras. The Camera Configuration page allows authorized users to modify the list of pre-configured camera positions to be collected from the site. A maximum of eight camera positions may be enabled per site. Once a user submits changes to the camera configuration, the system will then attempt to immediately send the configuration changes to the RWIS site. This will only be successful when the communications channel to the site is available and your system has been configured for on demand data retrieval. Queued changes that are not automatically sent in this manner will be transferred during the next scheduled communications session. Changes that have not been sent to the RWIS site will be identified on the configuration page by a note displaying the user making the latest request and the time of the request. A link will also be provided to the Camera Configuration Log, which displays the last several camera position change requests. Once on this page, users can change the time period covered by the log and link to the glossary by selecting the column heading links to see a definition for each data item. These pages are only provided if the site has been configured to support a camera with multiple camera positions. The Traffic Status page displays the same information as the Traffic Summary page; however, only traffic data for a particular site is displayed. If the site is configured with a camera, the current camera image will also be displayed on this page. The camera image also provides a link to the site's Camera page. A link to each site's Atmospheric History page is provided in the Site Data Menu Section. Refer to the History Data section of this document for details. provides several pages which allow users to view current and historical bridge sprayer data for bridge sprayers that are installed at NTCIP sites. There are also pages that allow authorized users to activate and change the criteria used by the RPU to automatically activate the bridge sprayer under the specified conditions. The following readings are provided for sites equipped with an internal bridge sprayer controller. Users can link to the glossary by selecting the column heading links to see a definition for each data item. Links will also be provided to each sprayer's history, activation, and configuration pages. The Bridge Sprayer Activation and Bridge Sprayer Configuration pages will require a username and password for access. The Bridge Sprayer Configuration page allows authorized users to modify the current sprayer configuration including the sprayer's mode, operating surface temperature range, maximum wind speed threshold, freeze condition criteria, and frost condition criteria. Once a user submits changes to the sprayer configuration, the system will then attempt to immediately send the configuration changes to the RWIS site. This will only be successful when the communications channel to the site is available and your system has been configured for on demand data retrieval. Queued changes that are not automatically sent in this manner will be transferred during the next scheduled communications session. A link will also be provided to the Bridge Sprayer Management Log, which displays the last twenty sprayer configuration change requests. Once on this page, users can change the time period covered by the log and link to the glossary by selecting the column heading links to see a definition for each data item. The Bridge Sprayer Activation page allows authorized users to manually activate a bridge sprayer. This page also displays the current bridge sprayer status. Once a user submits a sprayer activation request, the system will then attempt to immediately send the request to the RWIS site. This will only be successful when the communications channel to the site is available and your system has been configured for on demand data retrieval. Any requests that are not automatically sent in this manner will be transferred during the next scheduled communications session. Activation requests that have not been sent to the RWIS site will be identified on the activation page by a note displaying the user making the latest request and the time of the request. In addition to the Traffic Summary and Traffic Status pages, provides traffic data for In Lane (some times referred to as permanent count stations) traffic sensors. These pages are only provided for In Lane sensors. Historical traffic counts for speed and classification will also be provided. provides several history pages displaying data in various formats. This section will describe each history page and the data displayed. 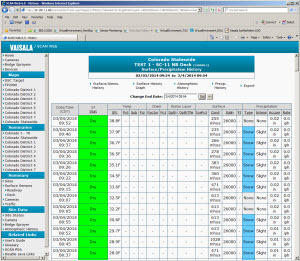 Each historical table view allows the user to specify the ending date of a 24-hour time period. Forward and back buttons also provide an easy way to scroll through history data. History links to other history pages are also provided so that users can easily switch between historical data views. Each table view also provides an export link that allows you to copy the data displayed (in comma separated format) into a spreadsheet or text file. At the top of each history page links are provided to additional history views. To view this page, select the Sf/Pc Table link. Each historical table view allows the user to specify the ending date of a 24-hour time period. Forward and back buttons also provide an easy way to scroll through history data. History links to other history pages are also provided so that users can easily switch between historical data views. Each table view also provides an export link that allows you to copy the data displayed (in comma separated format) into a spreadsheet or text file. At the top of each history page links are provided to additional history views. To view this page, select the Sf/Atm Table link. Each historical table view allows the user to specify the ending date of a 24-hour time period. Forward and back buttons also provide an easy way to scroll through history data. History links to other history pages are also provided so that users can easily switch between historical data views. Each table view also provides an export link that allows you to copy the data displayed (in comma separated format) into a spreadsheet or text file. At the top of each history page links are provided to additional history views. You can also access this page from the Site Data menu section. To view this page, select the Atmos Table link. Each historical table view allows the user to specify the ending date of a 24-hour time period. Forward and back buttons also provide an easy way to scroll through history data. Each table view also provides an export link that allows you to copy the data displayed (in comma separated format) into a spreadsheet or text file. You can access this page by selecting the History link from the Snow Depth table on the Site Status page. Users can link to the glossary by selecting the column heading links to see a definition for each data item. Snow Depth is only supported for NTCIP sites. Each historical table view allows the user to specify the ending date of a 24-hour time period. Forward and back buttons also provide an easy way to scroll through history data. History links to other history pages are also provided so that users can easily switch between historical data views and graphs. Each table view also provides an export link that allows you to copy the data displayed (in comma separated format) into a spreadsheet or text file. You can access this page by selecting the History link from the Subsurface table on the Site Status page. Each historical table view allows the user to specify the ending date of a 24-hour time period. Forward and back buttons also provide an easy way to scroll through history data. History links to other history pages are also provided so that users can easily switch between historical data views and graphs. Each table view also provides an export link that allows you to copy the data displayed (in comma separated format) into a spreadsheet or text file. You can access this page by selecting the History link from the Water Level table on the Site Status page. Each historical table view allows the user to specify the ending date of a 24-hour time period. Forward and back buttons also provide an easy way to scroll through history data. Each table view also provides an export link that allows you to copy the data displayed (in comma separated format) into a spreadsheet or text file. You can access this page by selecting the History link from the Bridge Sprayer Status table on the Site Status or Bridge Sprayer Summary page. Each historical table view allows the user to specify the ending date of a 24-hour time period. Forward and back buttons also provide an easy way to scroll through history data. History links to other traffic history pages are also provided so that users can easily switch between historical data views. Each table view also provides an export link that allows you to copy the data displayed (in comma separated format) into a spreadsheet or text file. You can access this page by selecting the History link on the Traffic Summary or Traffic Status page. The Daily Traffic Count page displays the total traffic counts for a sensor for the specified date. Totals are broken down by hour and subtotals are shown for Normal and Long Volumes for all types of traffic sensors. Subtotals for traffic classifications and speeds are provided for all In Lane traffic sensors. Each Daily Count page allows the user to specify a date and you can access this page by selecting the Daily Count link from the Traffic Summary or Traffic Status page. Each historical table view allows the user to specify the ending date of a 24-hour time period. Forward and back buttons also provide an easy way to scroll through history data. History links to other traffic history pages are also provided so that users can easily switch between historical data views and graphs. Each table view also provides an export link that allows you to copy the data displayed (in comma separated format) into a spreadsheet or text file. Each historical table view allows the user to specify the ending date of a 24-hour time period. Forward and back buttons also provide an easy way to scroll through history data. Each table view also provides an export link that allows you to copy the data displayed (in comma separated format) into a spreadsheet or text file. You can access this page by selecting the History link from the Device Status table on the Site Status page. Each historical table view allows the user to specify the ending date of a 24-hour time period. Forward and back buttons also provide an easy way to scroll through history data. You can access this page by selecting the History link from the Device Status table on the Site Status page. Each historical table view provides an Export link that allows a user to create a comma delimited web page. Each page historical export page provides instructions on how to export the history data into text file. You can export history data in 24-hour slices. This provides a simple way to export RWIS data into a spreadsheet or text file for external analysis. It is also possible to export historical data from history tables by highlighting the data and "cutting and pasting" the data you wish to export into a spreadsheet program such as Microsoft Excel.